Covering the Devizes and Wiltshire area. McCrory Plumbing and Heating is a family owned and run company which provides some of the highest quality work in the surrounding catchment area of Devizes, Wiltshire and beyond. Both as a sub contractor to prime contracts and to private or domestic home owners. Delivering reliable plumbing and heating solutions from installation, maintenance, repair and upgrade to all types of plumbing and heating systems. Toilets, showers and bathrooms, kitchens and utility rooms through to complete air and ground source ecological heating systems. 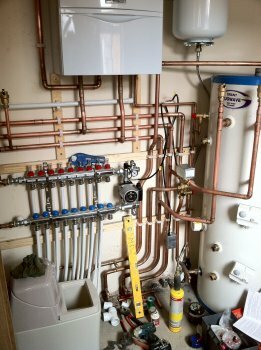 Established in 2008 McCrory Plumbing and Heating has developed a solid reputation for delivering consistent high end quality service across Wiltshire whilst actively managing both the cost and time elements to ensure all customers, business or private, receive the best possible value for money that can be achieved. Registered with Gas Safe the we are qualified and competent to undertake out all plumbing and heating tasks. Installation, repairs and maintenance to mains gas heating systems and we are approved installers for a number of leading central heating manufacturers and suppliers. Working closely with a network of highly skilled, trusted and reliable associated local tradesmen across Wiltshire, McCrory Plumbing and Heating is able draw in these tradesmen as required to offer the "complete service". This ensures that the project management of the associated trades is managed effectively and efficiently. Whether its plastering, electrical alterations,specialist commissioning, groundwork's, building,carpentry or cabinetry work that needs to be undertaken to ensure delivery of the finished project, McCrory Plumbing and Heating can provide the quality service you are looking for. Regardless of if you have a detailed specification to meet or just some ideas that need some final guidance to pull together contact us for a free "no obligation" estimate. or just for some honest advice. McCrory plumbing and heating engineers are waiting to work to your needs and provide an expert service.